News > Blog > Eat Before you Tweet! Wednesday 26th was our “Switching Off!” event for Social Media Week Glasgow. Em Saanen and I spent three fascinating hours in the company of some even more interesting people, exploring what it means to us be mindful in the Social Media universe. It became quite clear early on that most of the participants were already much more mindful in their Social Media use than we had expected. On reflection, I suppose this isn’t really surprising, since those that were attracted to the workshop’s title and content were very likely to have been at least half way towards us in attitude. So, a little adjustment took place along the way and we opened ourselves to learning a lot from the participants. What emerged is that there can be real resistance to the idea of doing one thing at a time. It is really how we all function nowadays – on numerous platforms all the time – that it it is almost seen as naive and silly to suggest focusing just on one thing, and people can become, understandably, very defensive of the current normality of existing in the Social Network. Even now, as a type (unusually at a desk) I am conscious of the “ping” of e-mail coming into my four inboxes. I have two other browser tabs open ( only two?) My smartphone is on the desk alerting me to Facebook posts and Twitter mentions. I am also drinking my morning latte and adding notes to the day’s “to do” list as I remember them. So I slow down, steady myself, and try to do just one thing at a time, thoroughly and completely. This blog. Breathe. Focus. Take my time. 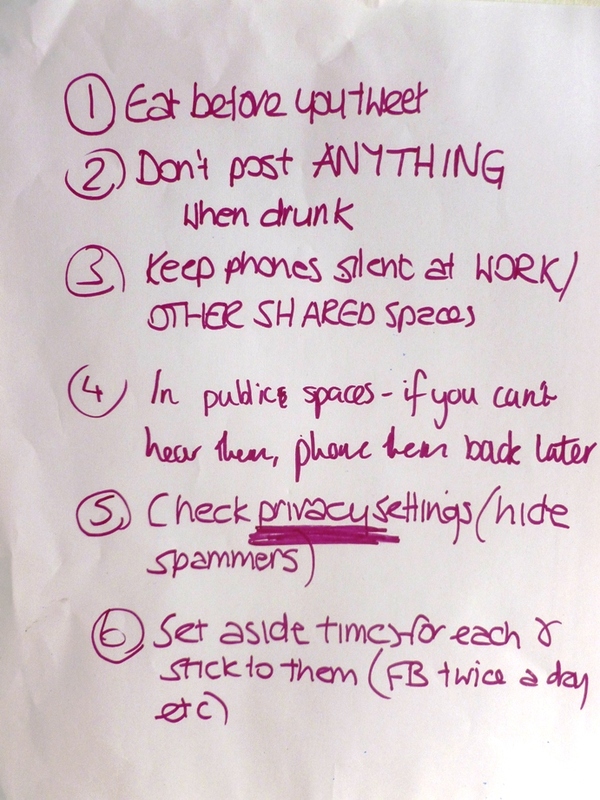 We finished with an exercise on Wednesday which we called “Be your own Guru” where the participants came up with their own lists of mindful guidelines for interacting on Social Media. Naturally, this got a laugh, but it is actually really good mindful advice. It may not be literally just about eating, but about attending to the stuff of real life before attending to your virtual world. When I first got a smartphone, I became aware that I was reading my e-mail even before I had rubbed the sleep out of my eyes in the morning. This is becoming normal. We have often “liked” our friends’ Facebook posts before we have said good morning to our spouses, had breakfast, patted the dog, had a shower…all of the things that we used to do before engaging with the outside world. Perhaps “Eat before you tweet” will become our new mantra?